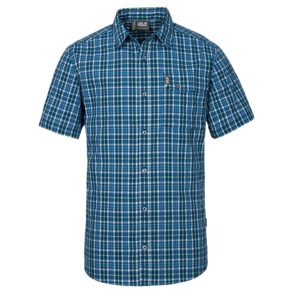 The Crossley Short-sleeved hiking shirt with moisture management. Ideal for travelling thanks to its light weight and easy-care attributes. The short-sleeve CROSSLEY is a simple travel and hiking shirt for warmer days. It is made from a breathable fabric that ensures pleasant wear and comfort at higher temperatures. The shirt’s easy-care polyester fabric is ideal for longer trips. And if temperatures cool, simply wear it under your fleece or pullover. Travel and hiking shirt very breathable, quick-drying. RELIEF CHECK Q.M.C. : checked fabric with active moisture management. Chest pocket.